How Far is ARN City Homes Padmavathy Avenue? Padmavathy Avenue is situated near Thathachariar Gardens, a famous place well known for its offering of 'Imam Pasanthu' type of mango fruits, most sought after all over the world. The location is housed in a place which is marked with tranquility and divinity. Absolutely freed from noise and pollution menace of city, still you are close to places of worship, reputed educational institutions, hospitals, picnic spots etc. At Padmavathy Avenue shades of greenery coupled with wide open spaces with fresh air would rejuvenate your failing spirit. It has an easy and convenient access. Feel free to enter and enjoy ideal and peaceful and perfect life. RCC foundation as per soil report. High quality vitrified tiles for the entire apartment, with vitrified skirting. Entrance lobby, staircase and common areas in natural stone flooring. Glazed tiles up to a height of 7' on toilet walls. Glazed tiles up to a height of 2' above the kitchen counter. Sparkling white sanitary ware including European water closet and wash basin. Good quality chromium plated taps and mixer. Panelled entrance door in teakwood. Moulded flush doors for bedrooms / toilets. UPVC windows with M.S. grills. Emulsion paint for internal walls and enamel paint for doors and window grills, external walls with exterior emulsion paint. Corporation water supply through sump and overhead tank in the Kitchen, subject to rules and regulations of Corporation Board. Borewell water for other usages. Concealed copper wiring. Adequate light points, fan points, 5 amps and 15 amps points etc., with independent meters for each flat. Modular type switches and provision for 3 phase electrical supply. Provision for cable TV in living room and master bedroom. ARN City Homes makes their foray into the land of religious fervour abetting river Cauvery with their prestigious project - Padmavathy Avenue Located in Srirangam, a place known for its divinity and peace, Padmavathy Avenue injects life to grandeur architecture of the past. Saddled with all the nuances of modern comfortable living, you can look forward to a lifestyle replete with all the ingredients in cool, comfortable and cozy Atmosphere. With an unblemished track record in civil works spanning over a period of five decades, ARN City Homes leaves no stone unturned in making an ever lasting impression with the launch of Padmavathy Avenue. Padmavathy Avenue from ARN City Homes is designed to provide real luxury with attendant comforts. 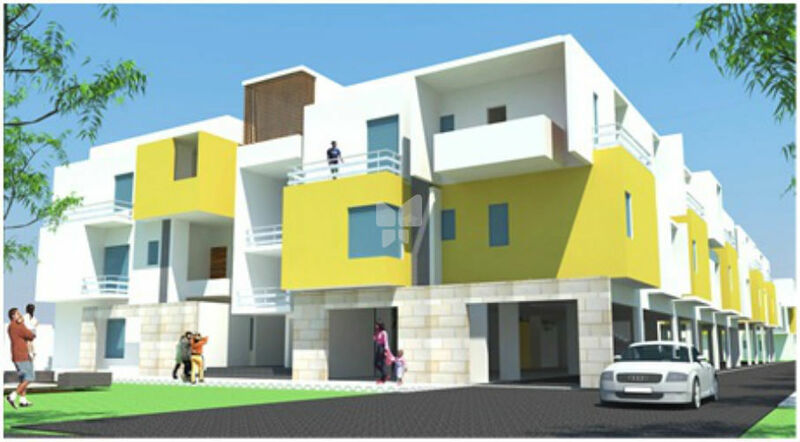 This project is spread over an area of one acre with two floors consisting of 38 flats. Padmavathy Avenue offers you 2 bed room flats. Each flat is designed with utmost care and laid out with deep thought by reputed architects. All the modern amenities makes life at Padmavathy Avenue a memorable experience. Calm and cool atmosphere leaves an indelible mark in one's mind.